Is it time to replace your old air conditioning unit? The age of the heating and cooling unit plays a huge role in the decision to repair or replace. Generally these units last for about 10 years before they start needing expensive repairs. There’s also a well-known “5,000 Rule” in the industry. We take the age of the equipment and multiply it by the repair cost. If that number is greater than 5,000, then you should consider replacement over repair. For example, if your equipment is 3 years old and the repair estimate comes in at $400, the total is $1200 and that unit is definitely worth repairing. However, if the unit is 8 years old and the repair cost is estimated at $700, the number jumps to 5600 and that unit should probably be replaced. Another point to consider related to the unit age is its efficiency. With big strides being made in the efficiency of these units over the past 10-20 years, an aging unit may not just be costing you money in maintenance and repairs. By replacing it, your costs to run your air conditioning may go down, sometimes significantly. This is also the case if the unit has mechanical issues. Similar to a car that is mechanically unsound and therefore uses more gas than a newer car that’s running in top form, older air conditioning units that have aging parts also use more energy than their newer replacements. Energy Star estimates a 20% savings on your energy bill when you replace your old air conditioning unit with an Energy Star rated unit. The SEER rating of a unit is the cooling output during a typical cooling-season divided by the total electric energy input during the same period. The higher the unit’s SEER rating the more energy efficient it is. In the U.S., the SEER is the ratio of cooling in British thermal unit (BTU) to the energy consumed in watt-hours. If your air conditioner was installed in the 90s or even early 2000s, your AC’s SEER is going to be less than 13—it will probably be more in the 7 – 12 range. The higher the SEER, the less your air conditioner will cost to run and the easier it will be for it to perform its job. If you have an inefficient air conditioner, upgrading it with a more efficient air conditioner will pay you back in just a few years and end up saving you a lot of money in the long run. Here at Restivo’s, the units we sell are much more efficient than their older ancestors. Have you had to top off your unit with R-22, commonly known as Freon? If so, that means there’s most likely a coolant leak. According to Angie’s List, topping off a system with R-22 refrigerant, known as Freon, costs as much as $40 to more than $175 per pound — which may also include the cost of the service call. Fixing the leak and putting in several pounds of refrigerant can cost $550 to $1,000. Needing to add Freon can be the start of a chain reaction of failures within the unit, ultimately ending up with the failure of the compressor, which can cost up to $2,000 to replace. When compared with the option to replace the entire unit, the lower-end units costs about the same as repairing a leak, adding refrigerant and replacing a compressor. R-22 prices, meanwhile, have soared in recent years due to the EPA’s eventual phaseout. HVAC manufacturers stopped making units “charged” with R-22 in 2010. Production of R-22 will end 2020. R-410A, a more environmentally friendly refrigerant, will replace it. Another major sign that your unit is struggling is if your home is not cool enough, despite the unit running constantly. The unit could have been installed before you added an addition, and maybe it is not large enough to cool the new larger home. Or it is simply old and having difficulty keeping up with the demand. 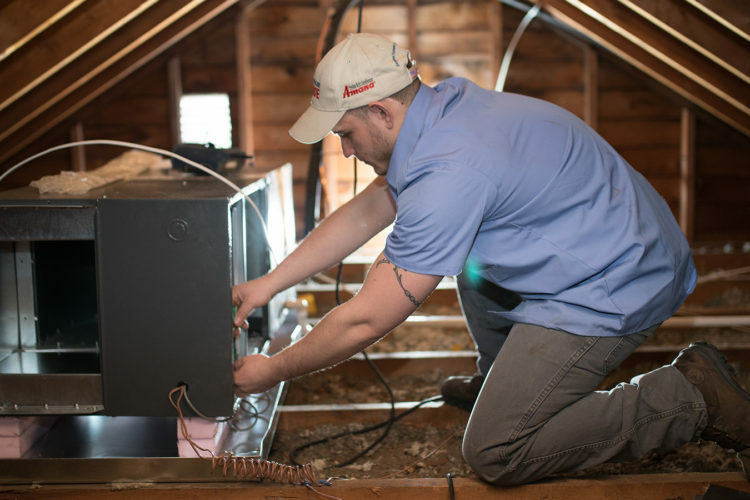 If you plan on staying in the home for years to come, a new unit would be an investment in your continued comfort and it would make sense to replace your old air conditioning unit. However, if you plan on selling the home soon, it may make more sense to pay for the repairs just to keep it in working condition. If you are starting to notice that your air conditioning unit needs repairs more often than it did, it may be time to have the Restivo’s crew look into the best option for a replacement. We will take into consideration all sorts of factors, including your budget, size of the home, and all of the other details that will ensure your new air conditioning unit is the perfect one for your family. Call us today at 401-351-REST to schedule a review of your current system to determine if it’s worth it to replace your old air conditioning unit or not. Stay cool! My AC unit is pretty old, so it’s not surprising that it’s been having so many problems. It makes sense that I would want to have it replaced! That’s definitely the kind of thing that I’m going to want to get a professional to handle. I don’t know a lot about air conditioning but I learned quite a bit reading your article! We are having problems with ours in our 1980’s home and I liked how you talked about the higher unit’s SEER rating the more energy efficient it is as a unit. Super helpful tip, if we do end up fixing it soon we will get a professional onboard to help out! It was really nice how you pointed out that aside from the costly repairs that come with an aging AC unit, one of the things that are also troubling is the idea that it is no longer running efficiently. I guess that means we really do need to get the old AC unit replaced with a new one. The unit that we are currently using has been around since I was young, and I am already married now. I will talk to my parents about this. Thanks! That is good to know that air conditioner units last 10 years before they start needing expensive repairs. My air conditioner had to be repaired a little while ago, and it was super expensive. I will have to see how old my hair conditioner is and see if I need to get it replaced. Thank you for the information! I didn’t know you could get up to 20% savings when you replace an old or outdated unit. This is something that my wife and I have discussed doing this summer. It seems like we are paying much more than our neighbors month to month.